One of our readers sent in the following images of some vestments on display in the Sacristeum in the Imperial Cathedral of St. Bartholomew in Frankfurt, Germany. There is a quality to this particular vestment which surpasses the ordinary. 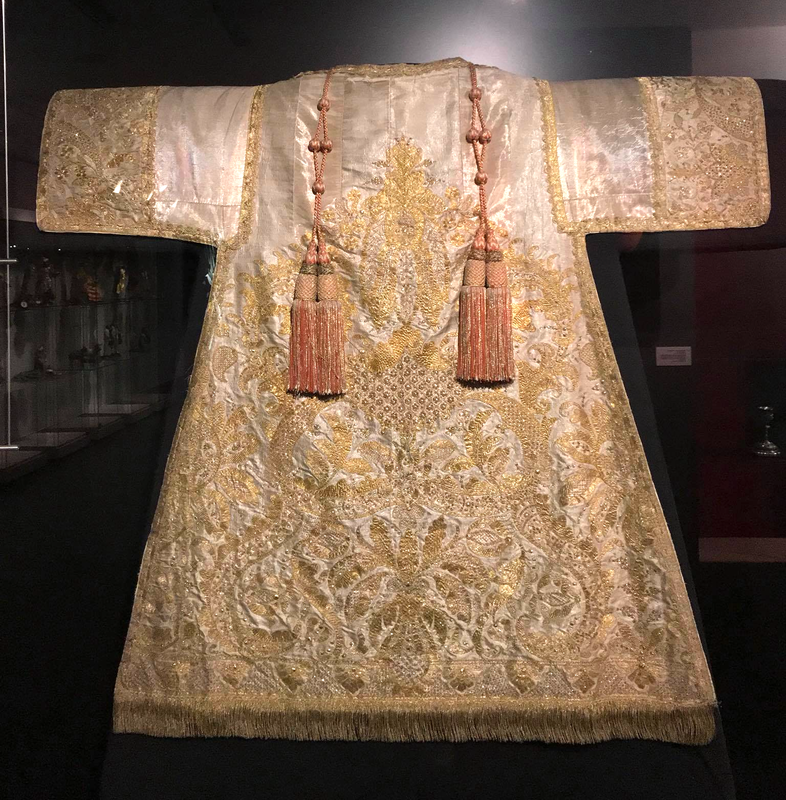 What first struck me was the quality of the embroidery work and the pale rose, gold and silver hues. There is also a unique aspect to its design since it is not common to see the embroidered details not cover the entire vestment. Because of these factors I asked our reader if he had any further details on the history of the dalmatic and fortunately he had some information provided by the cathedral. This particular dalmatic (and the rest of the set that goes with it) was made from the wedding dress of Margravine Sophie Christine Louise von Brandenburg-Bayreuth (1710-1739), a member of the German nobility belonging to the House of Hohenzollern and, through her marriage to the Prince Alexander Ferdinand, of the Princely House of Thurn and Taxis -- of which she was hereditary princess. The set was made in Frankfurt circa 1734-1735 of silver lamé lampas and is embroidered with gold thread. The set was first used at Candlemas in 1735. Really quite exquisite craftsmanship and a pertinent reminder that in our tradition, the textiles utilized in vestment works were not necessarily uniquely "ecclesiastical" in our modern sense, but were put to ecclesiastical purposes -- and often to very great effect. In addition to this piece, here are a few more selections from the Sacristeum. 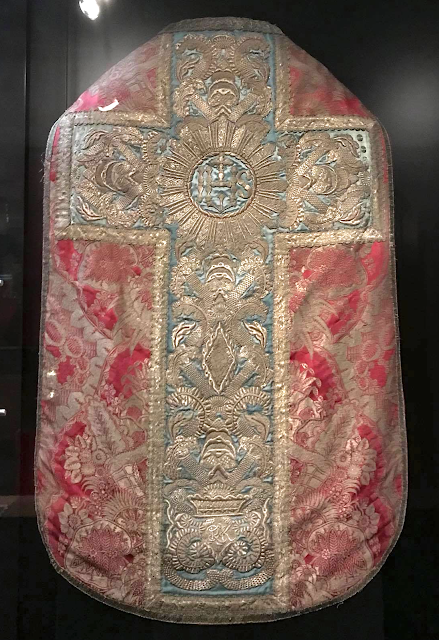 This first one is a rather unique chasuble, quite likely also 18th century; it is unique because of its proportions. Interestingly the central image is of Our Lady of Guadalupe. She is surrounded by eight roses and four angels. 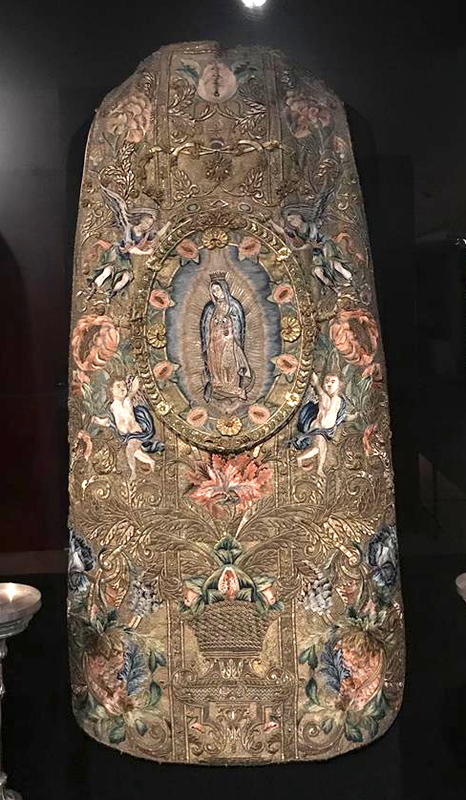 Between that image and the shape of the chasuble, my suspicion is that this chasuble may have come from Spain. 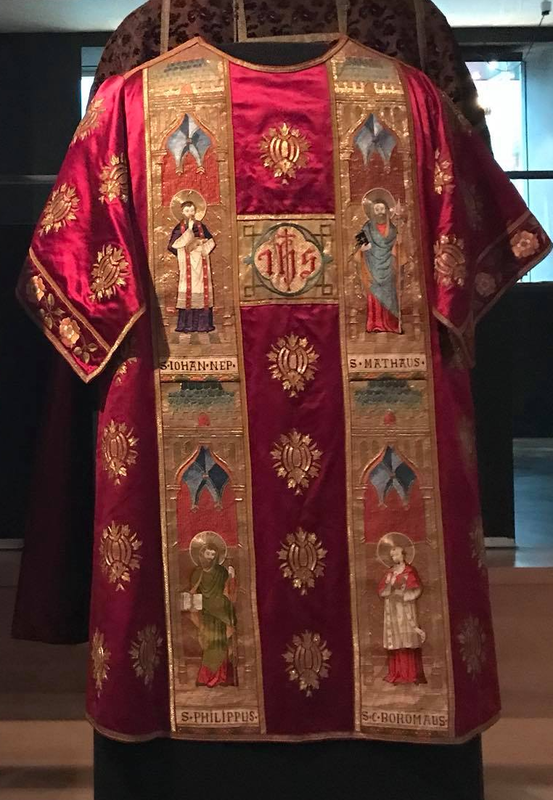 For those with slightly more medieval-like tastes, we have this red dalmatic/tunicle with exquisitely decorated orphreys showing four saints, St. John of Nepomuk, St. Charles Borromeo, St. Matthew and St. Philip. This is quite likely a 19th century work coming within the context of the gothic revival. Finally we have this beautiful red chasuble which, like the first two examples, is also quite likely from the 18th century. The red textile has a beautiful pale gold brocade woven throughout which features various floral and organic motifs. 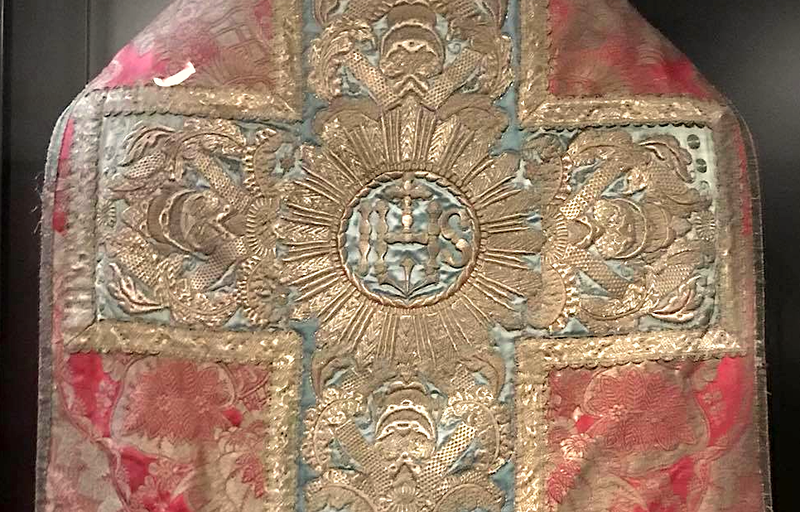 The cross is richly textured gold set on a pale blue, in the centre the distinctive Jesuit IHS monogram with its cross and three nails, surrounded by a sunburst pattern.